The 2017 Comicon convention season may be over, but there’s still time to celebrate those amazingly talented geeks who make comic conventions entertaining and visually stunning. That’s right, I’m talking about cosplayers! Most of time, media attention focuses on only male cosplayers, particularly those of the “hero” persuasion. The Women Vs. Cosplay project seeks to balance that out by shifting the focus to talented female cosplayers of many skill levels. 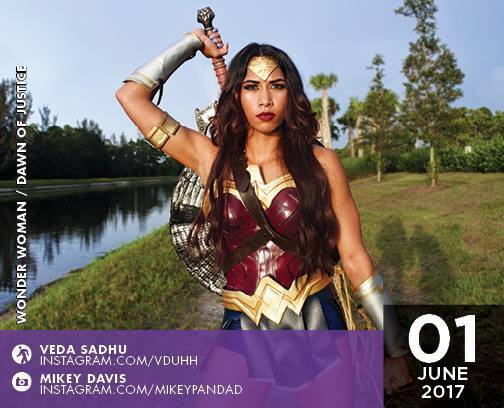 The brainchild of local artist Anabel Martinez, Women vs. Cosplay is an annual cosplay calendar that celebrates the diverse and talented women of the cosplay community. Women vs. Cosplay launched in 2014 with a Kickstarter for their 2014 18-month Gaming Calendar, which features men in video game cosplays. The format evolved into a 365 page-a-day style calendar that spotlights a different cosplay lady every day! This allows for inclusion of more cosplayers than their previous month-to-month calendars. Women vs. Cosplay has grown in popularity and the scramble is on to be included in next year’s calendar. Recruitment for the 2018 page-a-day style calendar continues until June 30 (or until all 300+ spots are filled). For more information about the Women vs. Cosplay calendar and recruitment requirements visit Womenvscosplay.com or on their Face Book Page.